We hear you’re planning a Spring Wedding, so congratulations! You just happened to have chosen one of the most gorgeous seasons in which to tie the knot, and with it, the opportunity to use some simply stunning Spring flowers on your big day. In this week’s blog, we’re looking at the flowers that are simply perfect for a Spring Wedding, as well as some of the floral trends that make us smile in Spring! The date of your wedding has a huge bearing on the types of flowers that you can use, and the price you’ll pay. Whilst most florists will be able to order imported blooms at any time of the year, it’s important to remember that if you’re desperate to use flowers that aren’t in season, then it will cost you lots more to buy them for your wedding day. If you use seasonal flowers, you’ll benefit from greater availability, meaning you can shop around and secure the best possible price. To help you select flowers for your Spring wedding, we’ve put together a list of blooms that are in plentiful supply at this time of year. Whether you’re planning a contemporary style wedding, or a country-inspired, rustic wedding day, Tulips are a wonderful choice due to the sheer number of colours that are available. You’ll certainly be able to find a shade that complements your overall colour scheme. Bunched together in single or mixed colours they are elegant and striking, and their streamlined looks work equally well when combined with greenery. 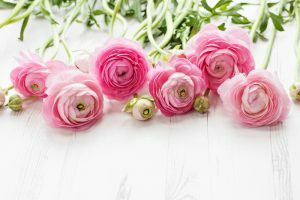 Romantic, dreamy brides will no doubt have already clocked ranunculus and earmarked it for their wedding flowers. Similar to a Peony, these are stylish and elegant blooms that need few other stems to make a dramatic statement. They have delicate, paper like layers and come in perfect pastel shades as well as more bold reds, oranges and purples. Peonies are delicate, romantic and super stylish. They’re a very popular choice for country weddings but can be expensive, so if you’ve having a Spring Wedding you’ll be relieved to hear that these gorgeous blooms are in season. They are never cheap to buy, but at this time of year they’re at their most affordable and easily available. 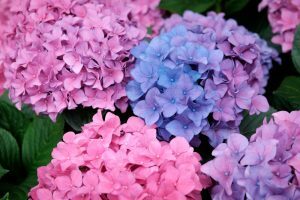 For a cost effective option, look to use Hydrangeas in your arrangements as due to their large size, you only need a few stems to make a big impact! This makes them perfect for table centrepieces, or worked into hanging ball Posies for younger bridesmaids to hold instead of a bouquet. For a quirky, fun and bold statement, then choose Gerberas to play a starring role in your Spring Wedding floral displays. With their daisy-like looks, these hugely colourful flowers look fabulous at contemporary weddings, and make stunning buttonholes or as decorations around a wedding cake. If you’re looking to make a statement with scent, you can’t go wrong with Freesias. These highly fragranced short stemmed flowers work wonderfully in posies and bouquets and smell heavenly. Available in stunning shades of yellow, pink, cream, purple, lilac, orange, white and red, if you want to create the most impact, it’s the red, white and orange varieties that are the most highly perfumed. We truly love to see bridesmaids and brides wearing beautiful floral crowns. We think there’s something hugely romantic about these amazingly natural accessories, that were once only seen at boho weddings. We’re happy to see the trend has spread, and we see lots of gorgeous country brides opting for flowers in their hair rather than veils or jewelled hair accessories. 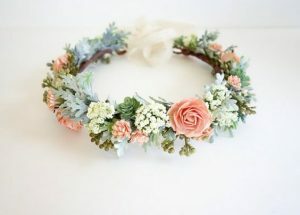 There are plenty of styles to choose between as floral crowns can be as delicate, or extravagant as you like. From simple, rustic crowns made from Gypsophila, to bold crowns bursting with blooms such as Gerbera, Ranunculus and Rose, this is one hot trend that would look utterly at home at your Spring Wedding. At Woodhall Manor we would love to help you plan a Spring Wedding. Give our super wedding planners a call today on 01394 411288 or email info@woodhallmanor.com to book a private tour of our stunning country Manor house and start to imagine your stunning Spring Wedding.